Are you interested in trying to make your backyard stand out from all the rest? One of the most stunning ways to do it is by incorporating a water feature into the mix, and these days, there are many different options for you to choose from. Whether you want to devote a large portion of your property to a large or elaborate new water feature or you just want to add something small that will make a big splash, there are a number of different types of water features that will add value to your property and change the look of the exterior of your home. Water gardens have become very popular among homeowners who want to add ponds to their backyards. These small ponds are designed with just a few fish in them to provide a soothing water feature that is more intimate – perfect for homes where space is at a premium. Another popular option is to create more intricately designed ponds that feature a number of rocks, waterfalls and plant life in and around them, creating a more immersive and unique garden area where you can relax to the sound of flowing water amid the peaceful greenery. Speaking of waterfalls, did you know that you can actually build a waterfall in your backyard without building a big pond to go along with it? HGTV reports on remote waterfalls as a popular option for urban spaces where the water falls into a bed of gravel and is then drained and recirculated to the top of the water feature. Bubbling fountains and rock column fountains are also good options that can be added on different scales, incorporating a central attention-grabbing feature that can really liven up the appearance of your backyard. Waterfalls, fountains and other features can also be included as part of an immersive pool design. 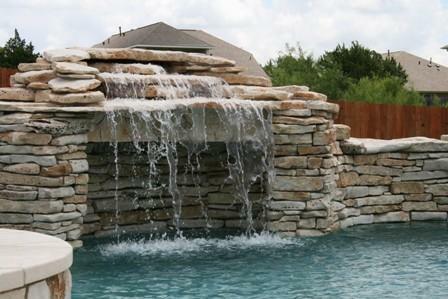 Create a custom pool with a central fountain or a tiered pool area that splashes a waterfall down into the swimming area. There are many different options to consider, and at Crites Custom Pools, we can build just about anything that you can come up with when it comes to water features. When you work with us, we’ll put our expertise to work for you, helping to design a completely unique pool or water feature that meets your vision and works within your available space – and budget. Check out some examples of our work online or call us at 512-759-2630 to schedule an appointment to sit down and discuss your ideas with our design team today.